Hiller’s Student Lighthouse Leaders create many fundraisers throughout the year to help people in our community. 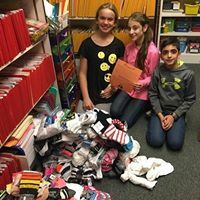 In October, Hiller Elementary held a fundraiser called Socktober which was a sock drive for homeless people. Our school donated 800 socks. This is how our school did Socktober. First, most of the students brought in socks for the homeless people. Second, each week two 5th graders that were Student Lighthouse Leaders came in to check on how many socks each class had.